1754 - Taneytown was founded as a part of one of the area's first land grants. Nearly 7,900 acres were granted to Edward Diggs and Raphael Taney under a patent designated as the Resurvey of Brothers Agreement. 1762 - The first lots were laid out and first deeds in Taneytown were registered. 1770 - Antrim was originally settled by Joseph McKaleb, who immigrated from county Antrim, Ireland, before the Revolutionary War, about the year 1770. He lived in the old stone house originally erected on the property. 1803 - Joseph McKaleb passed away, giving the property to one of his sons, Major John McKaleb, then an enterprising merchant in Taneytown. 1836 - Carroll County was formed by taking the following hundreds from Baltimore County: North Hundred, Pipe Creek Hundred, Delaware Upper Hundred, Delaware Lower Hundred; and from Frederick County: Pipe Creek Hundred, Westminster Hundred, Unity Hundred, Burnt House Hundred, Piney Creek Hundred, and Taneytown Hundred. 1843 - At his death, John McKaleb's daughter Margaret Ann McKaleb inherited Antrim. 1844 to 1847 - Major Andrew G. Ege, Margaret's husband, erected the present elegant Mansion, together with many outbuildings of a size and quality rarely seen upon country estates at the time. Constructing the main building of brick, being 50-feet square, three stories high, and walls 22-inches thick, surrounded by a broad veranda reaching to the second story. The back building gave to the property and L-shape, two stories high, 60-feet long by 40-feet in width with a veranda extending the whole length. The ceilings of the Mansion were constructed at 13-feet high, divided into four rooms on a floor by a hall 11-feet wide. The mansion was surmounted by a cupola, ten-feet square, enclosed by glass, from which the view from the surrounding country provided an incredible view of the area's landscape. The lumber used in the woodwork of the building 'was without a knot or blemish.' Two marble mantlepieces, in the lower rooms, were wrought out by the hands of the celebrated sculptor William Rinehart. There were 25 rooms in the entire building, including a well-lighted basement. The skillful master workman who constructed the building and superintended its erection from the foundation to the apex, was Benjamin Forrester, of Baltimore City, then of Westminster, who also built the jail of Carroll County. The Mansion was surrounded by an ample lawn, studded with fine spreading shade trees of different varieties, planted by Major Ege. 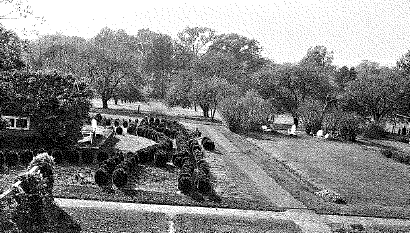 The lawn was laid out into circles, squares, and walks, and covered with a velvety sward 'kept neat and trim by a true son of Erin, who is himself from county Antrim, who has become almost a part and parcel of the place'. The outbuildings are all in keeping with the Mansion. The barn was 100-feet long by 60-feet wide, the lower compartments well-plastered, affording stable room for a large number of horses and cattle. There was a large carriage and harness house, sufficient for several carriages. A large hennery for the shelter of the poultry, and an ice house twenty-feet deep, with sufficient capacity for the storage of ice enough to last all the year round. There were a number of other outbuildings, all neat and tidy, giving the place the appearance of a village. There was also a brick office, 24-feet square, used by Major Ege as a business office and a repository for books and papers. 1851 - Margaret Ann McKaleb Ege passed away and was buried in the Piney Creek Reformed Presbyterian Church Cemetery in Taneytown, Maryland. 1855 - After her death, Major Andrew Ege married Matilda Craighead from Pennsylvania shortly thereafter and moved to Kansas. Col. James Piper, of Baltimore city, purchased Antrim, listing it for sale in 1857. 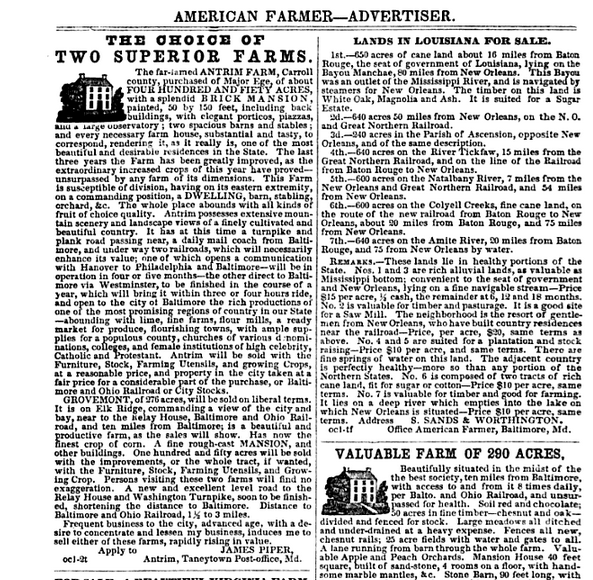 1862 - Laura Elizabeth Williams, wife of James H. Maddox, former owner and editor of the New Orleans Crescent until 1855, purchased Antrim for $40,000 (equvalent to over $900,000 in today's currancy) and moved their family there. 1863 - General Meade's troops make their way through Antrim. 1863 to 1873 - Antrim was purchased by Horatio Nelson Gambrill, a wealthy Baltimore manufacturer. He is best known for building Druid Mill on his own in 1877. It was the largest mill in the state, interesting in note that Gambrill built his mills with stone, when other other mill owners built with brick. Gambrill sold off portions of the Antrim property as town lots, including one to William Reindollar mentioned in the gallery above. 1873 - Antrim was sold to George E. Clabaugh. At this time, the property was comprised of 420 acres, with the Frederick and Pennsylvania Line Railroad passing through a portion of the estate. His son, Harry Morris Clabaugh, was elected Attorney General of Maryland (1895-1898) and was appointed Chief Justice of the Supreme Court by President Roosevelt in 1903. Benjamin P. Lamberton (1878-1938) married Helen Clabaugh (1881-1946) and had three children, Harry, Ben and Helen. Antrim 1844 remained in their family’s possession for nearly 100 years. Many dignitaries from Washington, D.C. frequented gala parties here and it was the site of many important functions and gatherings. 1873 to 1885 - George Clabaugh makes improvements and additions to the property for the sum of $10,000, including the addition of a Springfield Gas Machine, located in the basement to provide lighting to the chandeliers throughout the Mansion. 1885 - Owned by Harry Morris Clabaugh, the then 420-acre estate, was occupied by three tenants, producing liberally all of the ordinary crops grown in this section, such as wheat, corn, oats, timothy, and clover. Approximately 15 horses were employed in tilling the farm and in the ordinary farm work for which horses were required. 1885 to 1920 - The 420-acre estate was distributed into lots and sold. 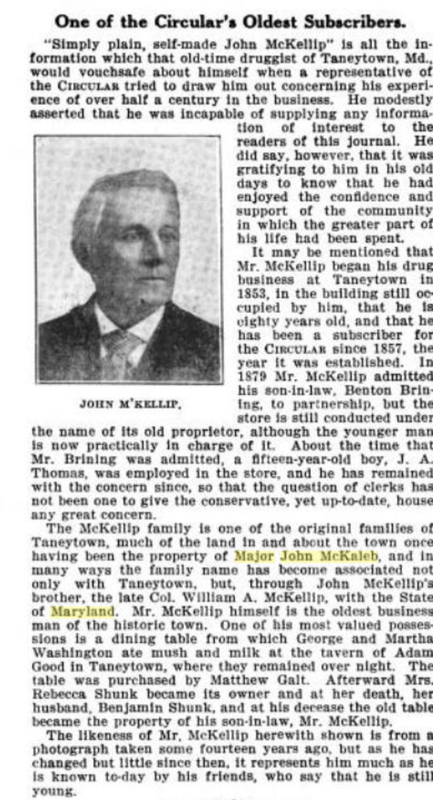 Much of the surrounding lots and downtown Taneytown once being portions of McKaleb's original land deed. 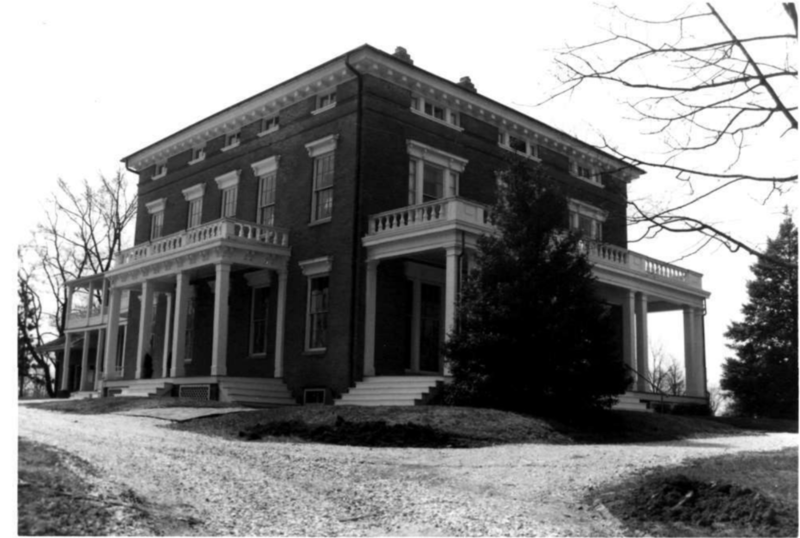 The Clabaughs maintained the surrounding 24-acres around the Mansion until sold in 1961. 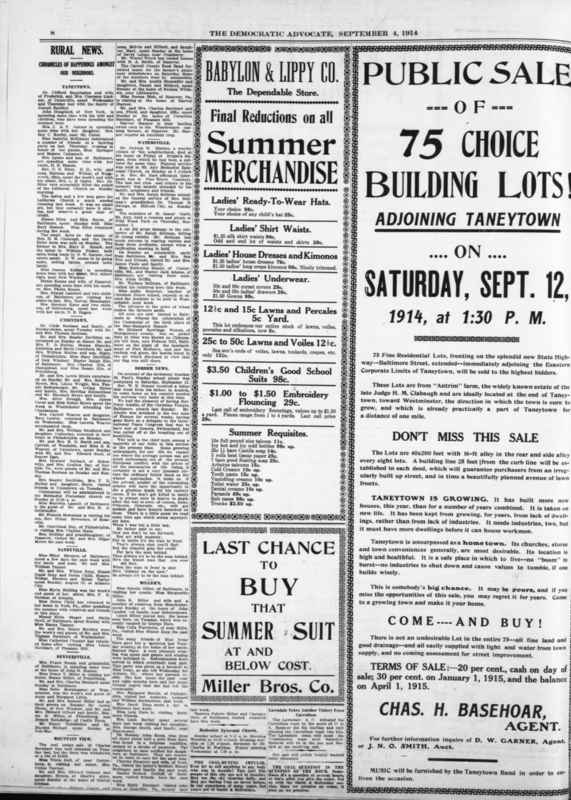 1961 - Antrim and its then surrounding 24 acres were purchased by George Crouse, a well-known Taneytown businessman. Although Mr. Crouse never lived in the house, he maintained it and opened it up to large functions and friendly gatherings. Most importantly, under Crouse's ownership, Antrim 1844 was honorably placed on the National Historic Trust Register. The Crouses decided to place it on the market after George Crouse passed away. 1987 - Dorothy and Richard Mollett saw Antrim for the first time and instantly fell in love. 1988 - By the end of 1988, Antrim 1844's mansion opened its first and second floors as a bed and breakfast with four handsome guest rooms; a peaceful respite from the hustle and bustle of life within close proximity to Baltimore and Washington, D.C.
1992 - The Molletts purchased the Smith House, named for Mrs. Smith who lived on the 100-acre farm from birth to her late 90s as a local and popular piano teacher. 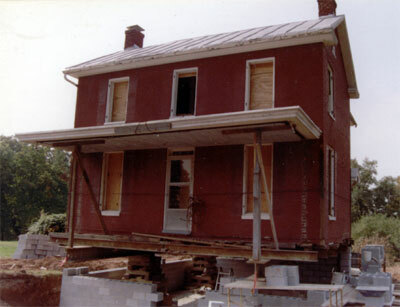 Originally built in 1865 and located near CVS in Taneytown, the house was relocated to Antrim in an effort to rescue it from demolition. It was used as their personal residence allowing them to open additional guestrooms in the Mansion and was later converted to guestrooms in 1998. 1992 - The Barn and Ice House were renovated, providing three additional guest accommodations. 1994 - The Cottage was renovated, providing one additional guest accommodation. 1997 - The Carriage House was renovated, providing six additional guest accommodations, including two suites. 2004 - The Birnie and Annan Houses were renovated, providing seven additional guest accommodations, including two suites. Once the home of Dr. Clotworthy Birnie, a prominent Taneytown physician, he was born in 1843 at his family farm in Glenburn. His nieces, Amelia and Elizabeth Annan resided at the Birnie residence. His doctor's office and waiting room were on the first floor. 2006 to 2007 - Three additional house purchases on Mill Avenue; Witherow, Slonaker, and Zepp House were renovated and opened providing 11 additional guestrooms. The Witherow House was once occupied by Harry, Grace, and Lester Witherow who resided in the house in the early 1900's. One of Grace's nieces, Wilma Witherow Wood Pecachek, was a dear friend of Dort and Richard Mollett. The Slonaker House was named after Bradford Slonaker who resided in the house from 1875 to 1918 and made annual trips to Vermont to personally select large stones which he carved into gravestones and transported to the cemetery in Taneytown. 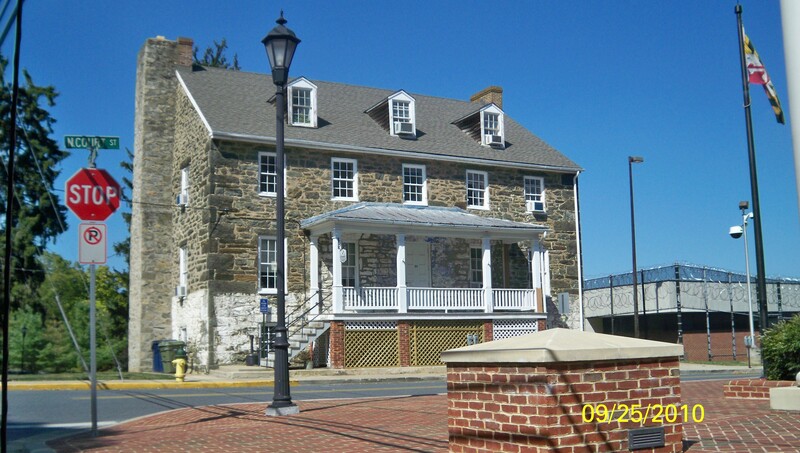 The Zepp House was originally the residence of famed Taneytown photographer, Edward Zepp. 2007 - Dort and Richard purchase Glenburn, restoring it as their residence. Built in 1840 by Rogers Birnie, he operated a boy's boarding school from 1847 - 1877. In the late 1800s, Congressman Joseph Goulden purchased the house and farm on Bear Branch Creek. In 1937, Chester and Gippie Neal of Kentucky bought it and raised a family there. Robert and Elizabeth Neal then took over ownership in 1983 opening Carroll County's first Bed and Breakfast.